Figure 1. (L-R) Featured artists Rickie de Jesus, Ralf Roldan, Manolo Valdez, Bong Delfin, Sancel Damonsong, Ambassador Philippe Lhuillier, Consul General Emmanuel Fernandez, Aurora Vozmediano, Alicia Kalaw-Fernandez, Rachel Gonzales, and Fr. Carlos Yurong, OP. 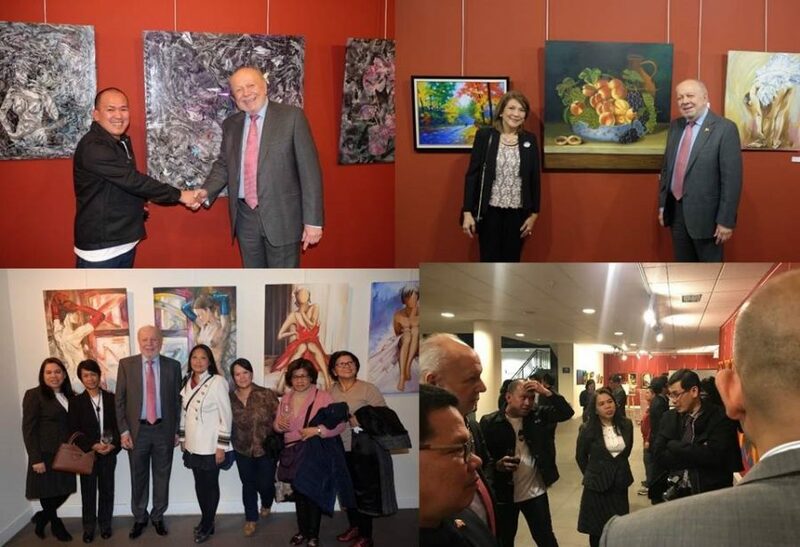 The Philippine Embassy organized an art exhibit at Centro Cultural Eduardo Urculo in Madrid, featuring the artistic works of Filipinos living and working in Madrid who pursue painting on the side as an avocation. Entitled “Litrato: Una Mirada al Alma de los Filipinos en España” (Litrato: A Glimpse of the Filipino Soul in Spain), the said exhibit seeks to provide the Spanish people an opportunity to recognize and appreciate the artistic talents of Filipinos in Spain who are more known and admired by Spaniards for their excellence at work. It is hoped that, through these artistic works, the exhibit would help to rectify the rather limited perspective that Spaniards have about Filipinos in Spain. 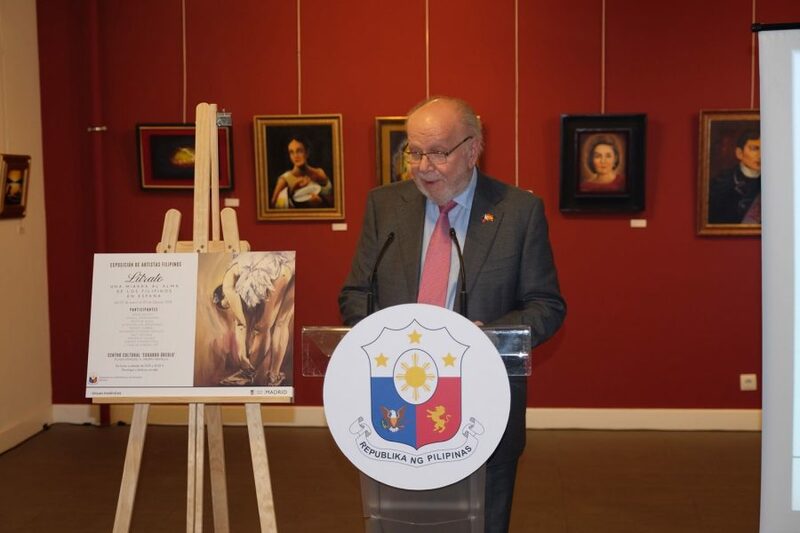 Ambassador Philippe J. Lhuillier presided over the launching ceremony of the aforesaid exhibit last January 24, which was attended by around 130 guests from the diplomatic corps, the cultural and religious sectors, and members of the Filipino community. The exhibit will run until 20 February 2018 at the Centro Cultural Eduardo Urculo in Plaza de Donoso 5, Madrid. The roster of artists exhibiting their works includes: Bong Delfin, Sancel Damongsong, Rickie de Jesus, Alicia Kalaw-Fernandez, Romeo Gabriel, Rachel Gonzales, Ralf Roldan, Manolo Valdez, Aurora Vozmediano, Father Carlos Yurong and the late Nicanor Custodio Hidalgo. The artists come from different professional backgrounds. The list includes a Dominican priest, a former bank executive, a teacher, a businesswoman, a religious volunteer, and those working in the services sector. In his speech, Ambassador Lhuillier said that there are an estimated 60,000 Filipinos in Spain with around 14,000 in Madrid alone. He stated that there is a need to help Spaniards acquire a broader and more nuanced understanding of the people that make up the Filipino Community in Spain. “We are often described as quiet, resilient members of a local community. We adapt easily and are able to assimilate ourselves without much difficulty into our new environment. Sometimes, we are so good at adapting that we forget to assert our collective personality as a people on the cultural landscape of a community. I believe it is time to find a compromise between seamless assimilation and consciously leaving a mark on society through one’s talent and culture,” the Ambassador explained. He further noted the need to work harder towards enhancing the links between the Philippines and Spain, and to make more visible to the Spanish people the 60,000 Filipinos who have made Spain their home. 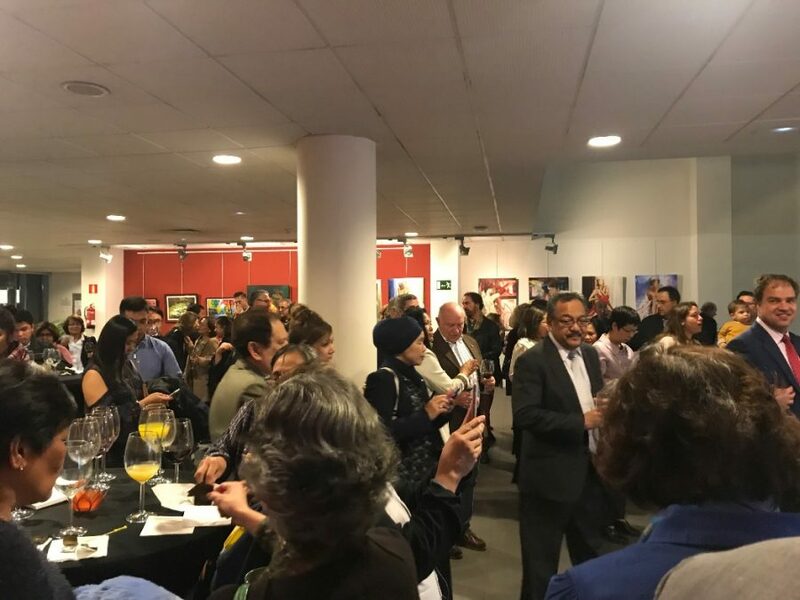 The Ambassador closed his speech by thanking the Director of the Centro Cultural, Ms. Paloma Pareja, for working with the Embassy and hosting the exhibit at the Centro. Figure 2. Ambassador Lhuillier delivering his Welcome Remarks. Figure 3. 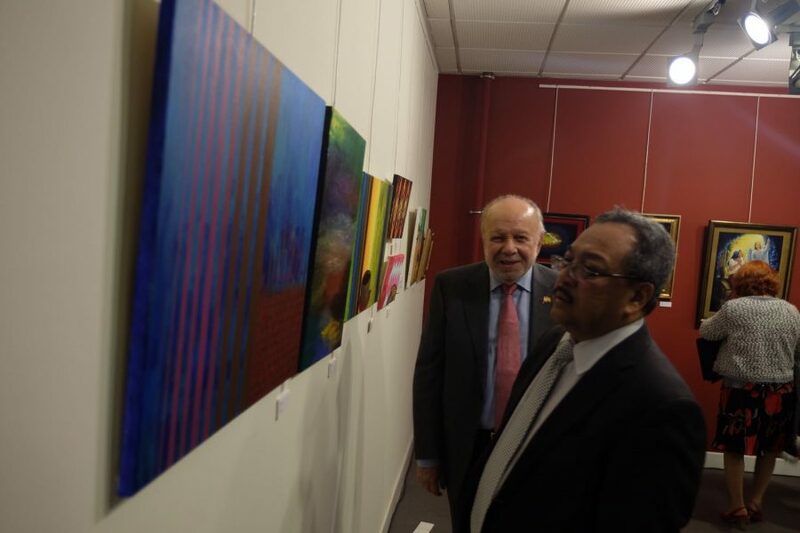 Ambassador Zainal Abidin Bakar of Malaysia and Ambassador Lhuillier viewing the works on exhibit. Figure 4. 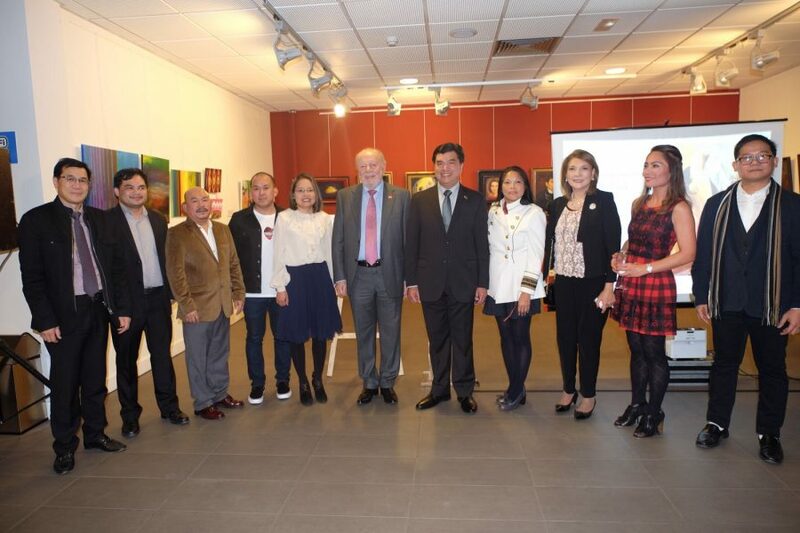 Ambassador Lhuillier poses with the artists and guests. Figure 5. Around 130 guests came to witness the exhibit launch.